Increasing numbers of people are now keeping healthy teeth into old age. This is thanks to several factors including regular dental and hygiene appointments, improved oral health education and better personal tooth care. As we all know, the most common cause of tooth decay is plaque. Left untreated this build-up of plaque can cause gum disease and eventual tooth loss. No matter how well you brush your teeth this build-up of plaque is constant. At your regular hygiene appointments, the plaque layer is removed – but it is possible to help slow this build-up with interdental brushing. 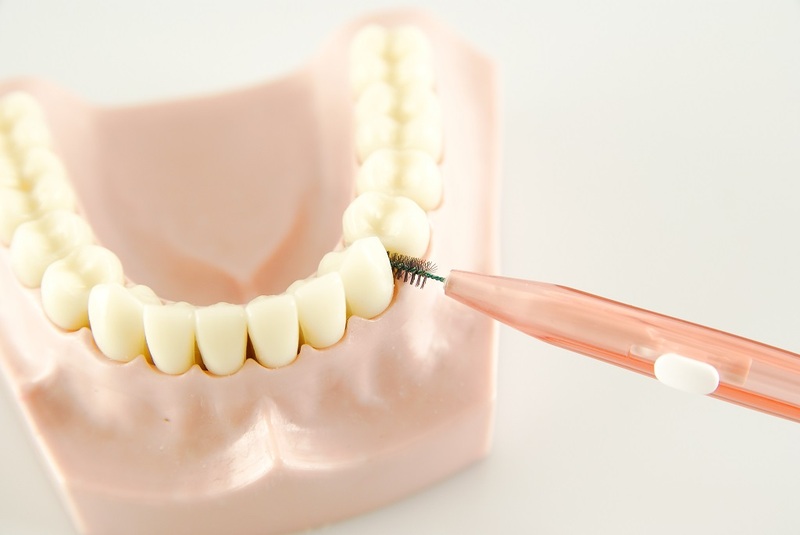 Interdental brushing is brushing between and around teeth with the use of various devices including dental floss, interdental brushes, single tuft toothbrushes, dental sticks, rubber tip stimulators and irrigation devices. Used daily, these items will help to remove food and bacteria from the places your toothbrush won’t reach – helping to protect teeth and gums until your next hygiene appointment. Even with the best tooth brushing there will always be parts of your mouth missed when using a standard toothbrush alone. Interdental devices help you to reach those areas of your mouth which may otherwise be forgotten or overlooked. Disclosing solutions can also be used to highlight areas of plaque that are left behind. Interdental brushing is the best way to maintain healthy teeth and gums – helping to reduce your risk of tooth decay, gum disease and tooth loss – in between trips to the dentist. Interdental brushing is just as important for those patients with restorative devices such as bridges, dentures and crowns. This is because the success and longevity of such items is highly dependent on the health of your existing teeth and gums. Your dentist or hygienist can give you further advice on interdental devices which are suitable for you. Interdental Brushing: £55.00 to see our Hygienist.